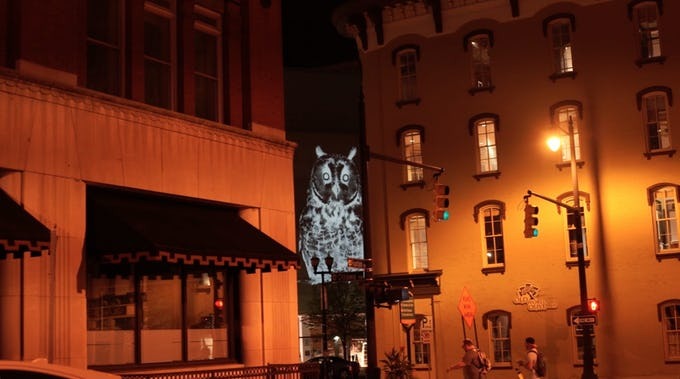 Collaborators Lauren Strohacker and Kendra Sollars reimagine traditional wildlife encounters in a contemporary format - through technology in an urban space with human inhabitants. Indoor and outdoor video projections generate synthetic animals, native to each geographical location, that are completely decontextualized. Void of natural environment, sound, and color, they are activated and influenced by the built environment and human interaction. Strohacker and Sollars are responding to the current and rapid loss of biodiversity and investigating a future where genuine interactions between humans and non-human animals may not exist. Animal Land is possible through relationships with local wildlife organizations. Animal Land is an on-going project. See all installation videos on Vimeo. Follow the project by visiting and liking our Facebook Page. In 2016, Strohacker and Sollars presented Animal Land: Visualizing Cohabitation & Conflict for the Annenberg Space for Photography's Iris Nights Lecture Series. Want to know where Animal Land has been and where you might find it? Check out the map below.